This stylish, Australian made bedroom suite is manufactured in Tasmanian Blackwood, and features glass top Bedside Tables and upholstery of your choice in the Bedhead. This product can be custom made to suit your space. This Australian made Bedroom suite features a timber bricked inlay at the top of the upholstered Bedhead and has blanket storage in the Bedfoot. This product can be custom made to suit your space. With clean simple lines the Botanical bedroom suite allows the timbers personality to standout, ensuring no 2 suites are the same. This suite features angled bedhead and elegant case goods. This product can be custom made to suit your space. 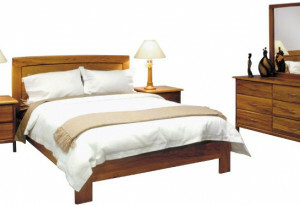 This beautifully crafted bedroom suite is manufactured using Tasmanian Blackwood. The suite features upholstered bedhead and generous sized case goods. 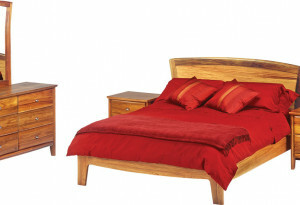 With it’s modern design the Eden will compliment any bedroom. 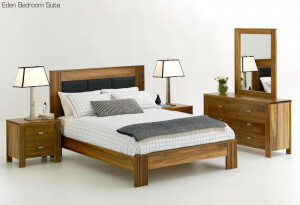 Manufactured using Tasmanian Blackwood, this stylish bedroom suite features an angled bedhead with leather (of your choice) insert, the soft clean lines are sure to enhance any bedroom. This product can be custom made to suit your space. 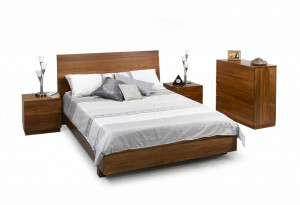 Contemporary in its design the Nico bedroom suite features clean sharp lines and under bed storage. 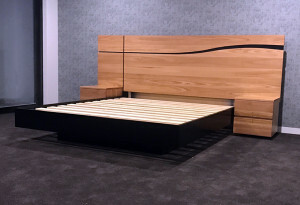 Manufactured using solid and veneered Tasmanian Blackwood this suite can be custom made to suit your space. A true classic! Manufactured using Tasmanian Blackwood the Radius suite has stood the test of time. With soft rounded profiles, this product suits a variety of decors and can be custom made to suit your space. 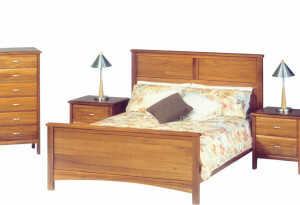 Manufactured using Tasmanian Blackwood, this timeless suite will add a touch of class to any bedroom.